Some time ago, I was introduced to the work of Sonya Clark. It encapsulates the truth, which resides in our bodies. Hair, for example, contains information about our biology that we often neglect or forget. Our predispositions, if you believe they exist are engrained in every part of the body. Clark explores hair in such a way that brings her understanding and experiences to everyone (not just African-American men and women). One of the many reasons I love Clark’s work is in large part due to use of the body and the tools we use to maintain our bodies. The Combs Series evokes how something so simple and trivial can reflect complexities and intricacies of beauty and self-care. Clark’s utilization of simple materials to create visual complexity contrasts how combs are often seen as cheap, plastic, low quality tools used simply to groom unruliness. “Deep with each strand, the vestiges of our roots resound. In this work hair is formed into markers of chronology, wisdom, and adornment”. Much of her work resonates with me because in the past few years, I’ve had probably close to a dozen different hairstyles in the past couple of years. Co-workers even rumored that I had shaved my head, which is far from the truth. I merely had an extremely short pixie hairstyle someone misspoke and interpreted as a shaved head. In any case, it dawned on me the importance people hold on hair and beauty. Some women allow such an external characteristic to define their femininity. Yet, Clark doesn’t (only) re-make and re-interpret her body to create beautiful pieces of sculptural work. She believes in showcasing how the body itself can serve as a medium. She profoundly sculpts the truth in our bodies within her work. Another (recent) short paper I wrote on artist, Fernando Botero, for the course, Contemporary Art: History and Theory taken at UC Berkeley Extension (for Post-Baccalaureate Certificate in Visual Arts). One of the fundamental lessons in drawing class entailed drawing untold numbers of fruit, boxes and bags. The exercises were required to instill the importance of actually depicting what existed in reality versus what the mind believes or thinks exists. I was often reminded that we first see everything the wrong way and that it is our brain that turns everything right side up. Understandably so, as the world and human cognitive processes evolve, ways of governing ourselves and let’s not forget the ways in which we’ve created social and gender constructs to function in the world and society at large; we often forget to try and understand a photographic depiction. We take it for what it is. From finding a photograph aesthetically pleasing to a sense of repulsion, there are instantaneous reactions. It’s the closest depiction of reality and how we physically see something. Yet, with post modern nuances of art entailing a conceptual and performative slant, it should not be forgotten the effectiveness of painting. I would like to ask the reader to combine the tenets of philosophy and art to re-contextualize the way in which painting, in contemporary times, can offer a much more powerful way of understanding politics and how it coveys philosophical concepts in such a way language is unable to capture. From Botero’s classical painting techniques, the viewer is afforded the opportunity to navigate biopolitics (as Foucault has coined), social constructs and ideology through the canvas. This new form of political power, or biopower, has evolved along two axes. Along one axis, it has developed a series of disciplinary technologies that come to bear upon the body as a machine. These technologies conform an anatomopolitics that aims to optimize the capabilities of the body by rendering it more docile and pliable to be inserted within systems of economic and political control and efficiency. Along the other axes, the body is treated not singularly but as part of a spe- cies, a genera, whose basis is entirely biological and organic. Here the body is seen as part of a system of life processes: birth, mortality, health, life expectancy, and anything that increases or decreases any of these. The body is seen as an instance of a species falls under the regulatory controls that conform a biopolitics of populations (Mendieta, 6). First, understanding that there is a way in which a viewer perceives their own body within a culture, a society of bodies, is crucial. If we were to examine Botero’s painting from a philosophical standpoint. There is an act of knowing and acknowledgement that must occur prior to engaging in Botero’s work. With the base knowledge of the body being part of a larger system, the body and mind become part of a larger system of symbiotic relationships. Exploration of those power relationships that Foucault is so well known for is all the power relevant in political and contemporary art. The contemporary art museum and gallery patrons can see this with the advent of specific types of museum and gallery collections (ie., Museum of African Diaspora, alternative art spaces to reach and represent various under represented minority groups, etc.). With many various groups in the arts and although a completely different discussion, I felt compelled to start with a specific way in which to view post modern (contemporary) painting from this lens. On the one hand, fatness stands in his paintings for the excesses of the privileged classes, which more often than not are ridiculed, scorned, and demoted. The haughty expressions, the ornate dresses, the regal accoutrements, the imperial posturing, are all neutralized and deflated by the heaviness of unbridled and undisciplined bodies. On the other hand, this very same abundant, solid, cherubic and baby-like fatness can be read as a form of humanization. What from an angle can be seen as an anxiety, from another angle, provided within the paintings themselves, allows us to see a vulnerable subject. Against a bourgeois, imperial, sovereign subject –Cartesian, Kan- tian, but most exactly, against the Cortésian and Pizarronian subject—Botero juxtaposes the cor- poreality of the flesh that is undisciplined and undisciplinable. We are irreducibly creatures of bod- ies that hunger and can die both of starvation or gluttony. Our flesh thus is always a source of a profound unease, for it can betray us to the same degree that it is what makes us vulnerable to another’s violence (Mendieta, 8). The very fact that Botero’s paintings bring up quite a dichotomous way of seeing and thinking in terms of how we place ourselves in time and space is what makes painting such a relevant art form in contemporary times, if and only if the painter makes the wise decision of provoking the viewer into that stage of detachment to see what is actually there and what ought to be understood. Comprehending in such a way that questions acts of violence and torture through an understanding of the body is only possible if the painter creates something that we cannot easily place meaning upon. In many ways, showing us what we think we know in an unparalleled and unconventional way. Painting has re-claimed its sovereignty over the field of representation and perception. Susan Sontag wrote, “photography is, first of all, a way of seeing. It is not seeing itself”…Painting, after the age of the mechanical reproducibility of chemically produced perceptual equivalences, teaches us that seeing itself is a way, a framing (Mendieta, 2). Mendieta, Eduardo. Moral Optics: Biopolitics, Torture and the Imperial Gaze of War Photography. Stony Brook University, New York. 2009. 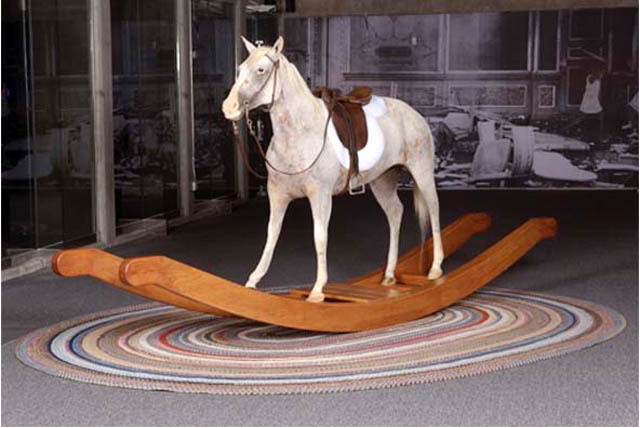 Although I haven’t seen Kathrine Worel’s piece, Rocking Horse Winner (2005) in some time, it’s unforgettable. In Fall 2008, I had the good fortune of spending one of the most lovely and enchanting evenings with the artist. Worel’s assertion that the horse serves as a ‘simulacrum of memory’ is a perfect description of my experience with the work. She provides the observer with a fondness for something they may have never experienced. The piece itself is grand and majestic. As you get closer, there is a growing sense of tension, an unnerving and unfolding of the past and all its imperfection. This is captured in her deliberate attempt to keep the mottled spots of hair and apparent aged look of an already decrepid horse. The saddle was once used by Worel when she was young. It is placed neatly on the horse as if it were waiting for a lucky rider. Of course, upon meeting any talented artist, it’s inevitable to ask what piqued their interest in creating a particular art work. She mentioned the short story, Rocking Horse Winner by D.H. Lawrence and I immediately went home, pulled up the story and read it. I read it twice. From my recollection, it sparked an interest in what people hold dear and how one can believe that their actions can determine an outcome. All this from a taxidermied horse? Yes, folks. Although an MFA piece, it gives me goosebumps and in the best way. One may see it as a bit abject yet a paradox of statements ensues with the viewer (like/don’t like, ugly/beautiful, strange/familiar, etc.). A mere picture won’t do it justice, this is certain. I would love to write something more extensively about Rocking Horse Winner since it is both intriguing and captures the essence of juvenile fascination with the imagination in an adult world.